How can psychotherapy harness the power of ephemerality? This paper offers an analysis on why Internet users are more prone to using ephemerality as a tool within social media, for instance, Snapchat and Whisper, compared to perpetual messaging applications, such as SMS and Facebook. In contrast to harnessing ephemerality as a digital method, this paper also studies ephemerality within therapeutic techniques, such as Free Form Writing (“Free Form Writing”, 2012) and Release Writing (Hassler, 2014). Through an interview with a Clinical Psychologist, insight was provided to better understand methods of how web users choose to handle their private memories, and if there are ways to forgetting negative perpetual recollections through ephemeral therapy. The data collected states that ephemerality creates an environment “of casualness, leading users to share anything from goofy selfies to sensitive information” (Javed, 2014), which can be used as a therapeutic journaling tool to “… experience a sense of relief and emptiness” (Hassler, 2014). Due to lack of studies and limitations of researchers focused in this field, it is necessary to analyze how ephemerality can be beneficiary within the field of Psychotherapy. The 21st century digital age, whether it be through social media or interaction with the web, has influenced how we, as users of the Internet, perceive memories. French historian Pierre Nora discusses (1989) the concept of Lieux de memoire, where we must “deliberately create archives, maintain anniversaries, organize celebrations, pronounce eulogies, and notarize bills because such activities no longer occur naturally” (Nora, 1989, p. 12). Technology has aided us in this process of archiving in order to off-load our cognitive storage. Professor Daniel M. Wegner emphasizes (2013) that “the Internet is taking the place not just of other people as external sources of memory but also of our own cognitive faculties” (Wegner & Ward, 2013). The emergence of social media dominated in the storage of memories in the forms of text, images, and much more media. As Garde-Hansen et al. (2009) highlights, “the personal archiving powers of increasingly popular and easy to use digital media” has significantly thrived, where “we are witnessing a personal digital archive fever, an obsessive desire to document and share our life histories and memories…” (Garde-Hansen et al., 2009). The rise of ephemerality within social media, as seen on mobile applications such as Snapchat, allows one to “keep [memories] intimate and … sacred”, as director Ondi Timoner (2009) once hoped for the future of social media in her documentary film We Live in Public, which demonstrates “the dangers of living our lives exposed” (Bahruth & Timoner, 2009). The desire to hide what was once accessible to the public eye has become a trend, even in the field of politics. For instance, the European Union (EU) passed a ruling called the “Right to be Forgotten”, which gives individuals the ability to “determine the development of their life in an autonomous way, without being perpetually or periodically stigmatized as a consequence of a specific action performed in the past” (Mantelero, 2013). There is an issue with the promise of ephemerality in the digital sphere: where one can never have anonymity. It is the sense that we are liberated from what we have said/done/posted on the web, but our memories will always haunt us (“Instant Anonymity”, 2014). This literature review studies the perception of memory archiving in the digital sphere and social media to find out why web users are more prone to using methods of ephemerality, the consequences, and positive applications of it. In order to fully comprehend why we tend towards ephemerality in the digital world, we must first understand perpetual messaging and their differences. Perpetual messaging examples include SMS, iMessage, Facebook, etc. Meanwhile, ephemeral messaging examples include phone calls, and mobile applications such as Snapchat and Whisper demonstrate ephemerality. It is thought that through perpetual messaging, “writing helps place one’s thoughts in a more visible, permanent, concrete, objective format” (Suler, 2015, p. 159). We tend to archive for factual records of “emotional high points, moments of intimacy, important personal information, or other milestones … humor, practical information, personal self-disclosures, emotional recollections, or intellectual debate” (Suler, 2015, p. 167). Some Internet users believe communicating via perpetual messaging has its benefits because “texting offers protection” since “you have time to think and prepare what you’re going to say, to make you appear like that’s just the way you are … you can control how you’re portrayed to this person” (Turkle, 2012, p.173). 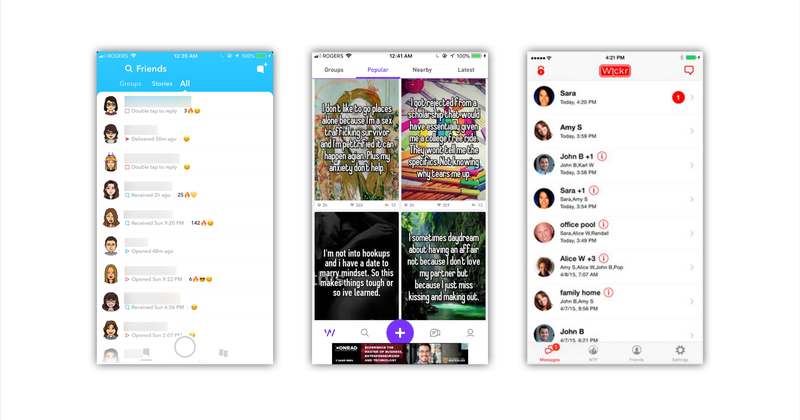 Examples of popular ephemeral mobile applications, such as Snapchat (Left), Whisper (Middle), and Wickr (Right). There are certain themes of ephemerality that are prevalent. Instructor Hira Javed discusses (2014) the psychology behind ephemerality, where it attempts to recreate the natural feeling of a conversation. It allows users to not “invest a lot of time and thought into what they communicate … less effort means sharing is easy and conversations are quick and frequent.” As a result, this creates an environment “of casualness, leading users to share anything from goofy selfies to sensitive information.” Features within applications also give users a sense of control, for example, how many seconds they can view “stories”, how the information is handled, and who gets to see it (Javed, 2014). Danah Boyd, researcher at New York University, believes (2014) that, “In a digital world where everyone’s flicking through headshots, images, and text without processing any of it, ephemeral content forces you to stand still and pay attention to the gift that someone in your network just gave you. Rather than serving as yet-another distraction, ephemeral content invites focus” (Boyd, 2014). While the future of digital fleeting remains popular, it is important to understand that memories have become “materialised and contained” and “somehow manageable [outside] the boundaries of our body” by many digital applications (Ghezzi, 2014, p. 2). Steve Chung concludes that (2013) we are navigating to ephemerality because users are “tired of leaving a digital trail [of memories] on social media sites that other people can judge them by” (Olson, 2013). The irony is that “many of the technologies from which we are requiring forgetfulness were not designed to be forgetful” (Ghezzi, 2014, p. 2). This happens to be the case with regards to the “Right to be Forgotten” ruling, which was created to “migrate the ills of digital memory” by giving “an individual [the right] to have certain data deleted so that third persons can no longer trace them” (Weber, 2011, p. 125). 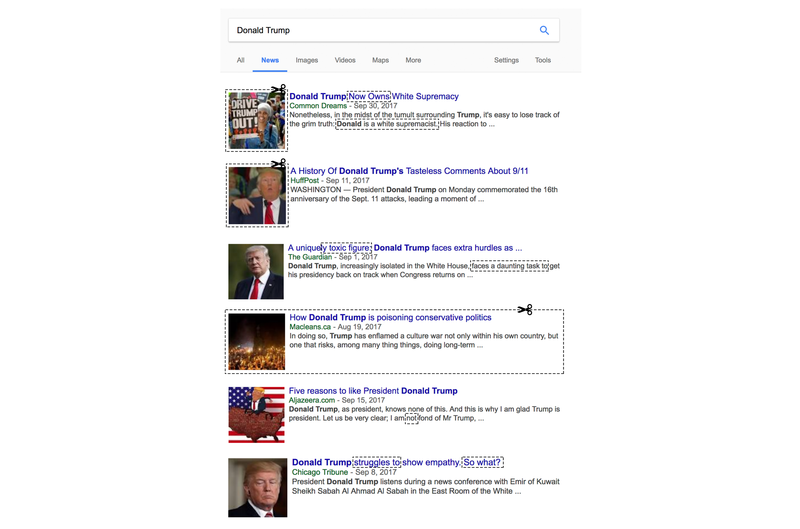 This can be seen with Google, a notable search engine, that promises that they “will balance the privacy rights of the [Internet user] with the public’s interest to know and the right to distribute information…” This gives Google the authority to reject claims which may conceal “financial scams, professional malpractice, criminal convictions, or public conduct of government officials” (Google, 2014). Many authors have taken stances to claim the implications of ephemerality in the digital sphere. For instance, the Executive Director of Wikimedia Foundation states (2014) that this “decision is undermining the world’s ability to freely access accurate and verifiable records about individuals and events” and how it creates “an Internet riddled with memory holes” (Tretikov, 2014). This idea of avoiding perpetual memories is expanded in the article We have no right to be forgotten online, where the author emphasizes (2011) that “our fundamental social existence as human beings means we are never truly forgotten.” It is impossible to live outside society, as “the world is modern and complex, bound by laws, conventions and culture. There are too many of us and we need organizing … people will always talk about and interact with each other.” As much as Internet users can try to keep their information and memories quietly hidden, “you can’t ask somebody to erase their memories” (Mayes, 2011). Who benefits from changing the type of information provided on them? Does the “Right to be Forgotten” ruling truly eliminate digital memories? Kevin Stephens once said (2013), “What we’re trying to enable is spontaneity and honesty” (Olson, 2013). If the digital sphere is continuously airbrushing memories through deletion and editing, how can ephemerality be truthful? Our experiences of others’ identities shift. In a study done by Qi Wang, who studied how well undergraduate students from Cornell University remembered social media memories compared to real life experiences, she concludes (2016) that “Memory is often selective. But in this case, the selection is not done by our own mind; it’s done by an outside resource, so interactive functions on social networking sites can also shape how we view our experiences, how we view ourselves” (Kelley, 2016). The modifying of social media reshapes how we perceive others and their memories, which can relate to how the “Right to be Forgotten” ruling can change how others appear on the social sphere. Additionally, others choose ephemerality to mask their identities, such as through mobile applications like Whisper. The application “allows users to communicate without providing or disclosing their identities by posting content for public viewing” (Whisper, 2017). Whisper “promises to get rid of information you don’t want everyone to know is a risky proposition” (“Instant Anonymity”, 2014). This start-up has recently been exposed for tracking anonymous users and their ephemeral “whispers” using geolocation. The users who were “encouraged to disclose intimate details about their private and professional lives” face intrusion on memories that were meant to be ephemeral (Lewis & Rusche, 2014). This privacy concern poses as an irony for sharing on an application that promises to shadow your identity in order to vent and allow for fleeting memories, because “you can’t really be sure of complete privacy, or that private data is actually going to stay private” (“Instant Anonymity”, 2014). The concept of ephemerality can be integrated into other fields, such as Psychotherapy. John-Roger Hinkins, founder of the Movement of Spiritual Inner Awareness (MSIA), initiated the technique of Free Form Writing, which helps “clear the unconscious. If you ever find yourself thinking, feeling, and doing things that you cannot explain or experiencing illness or pain with an unknown cause, this technique may assist you.” This technique is split up into three main steps. Firstly, the writer is encouraged to “Get a pen and a pad of paper. Sit somewhere comfortable where you won’t be disturbed as you are writing. Set an intention for your writing.” Secondly, the writer is encouraged to “Allow a thought into your mind and transfer it into the pen.” Hinkins states (2012) that, “It is important that you do not do free-form writing on a computer or a typewriter. Free-form writing is a kinesthetic activity: the neural impulses from the fingers are sent back to the brain so that the writing actually releases and records the patterns of the unconscious.” Thirdly, the writer is instructed to “[Let] go after writing”. Hinkins states (2012): “When you get through writing, do not read it over. Rip up what you have written and burn it.” Similar to ephemerality, Hinkins asks writers to “be aware that you are not giving yourself over to anything in this process because you are in absolute control of what is happening”, and encourages the destruction of information (“Free Form Writing”, 2012). As Hira Javed mentions (2014), ephemerality “gives users control” by “letting the user drive their own experience” (Javed, 2014). Although Free Form Writing is encouraged to be on “a pen and a pad of paper” instead on a digital space, compared to most ephemeral applications, the concepts of physical ephemerality remain similar. This concept has been integrated into various self-help books, which can be seen in Christine Hassler’s Expectation Hangover: Overcoming Disappointment in Work, Love, and Life. With experience in the field of Spiritual Psychology, Hassler elaborates on Hinkin’s method, and renames it as “Release Writing”. Hassler claims (2014) that, “Release writing is much different from journaling because it is more ‘stream of consciousness’ in approach. Unlike journaling, where you are writing in a slower, more thoughtful way to allow interpretation and reflection, release writing is really a process of dumping” (Hassler, 2014). Compared to Release Writing, “The main purpose of journaling is to document and reflect on experiences as a way of thinking, understanding and learning” (Hayman, Wilkes, & Jackson, 2012, p. 28). Journaling is a perpetual form of writing, as its aim is to document and archive as opposed to “[Let] go after writing” (“Free Form Writing”, 2012). Hassler creates an “environment of casualness” (Javed, 2014), which can be seen in ephemerality, by mentioning that writers should not “worry about spelling, punctuation, or the legibility of what you are writing. Keep writing until you experience a sense of relief and emptiness. Upon completion, burn or rip up the paper to release the energy. Do not interpret, analyze, or go back to read what you wrote, because that would only recycle your emotions” (Hassler, 2014). In more recent studies, this technique has been used in digital spaces as opposed to on paper. In a controlled experiment, researchers (Briñol, Gascó, Petty, & Horcajo, 2012) asked “78 undergraduate students from Universidad Castilla La Mancha in Albacete, Spain … to type in the computer their negative thoughts … Some of the participants were asked to use the mouse to move the electronic file to the recycle bin (physical-disposal condition), whereas others were asked to use the mouse to move the file to a storage disk (physical-protection condition)” and other “participants were asked to mentally visualize themselves moving the files to the recycle bin (mental-disposal condition).” From the results, the researchers found that those who “[moved] the electronic file to the recycle bin” were less affected by the negative thoughts they typed on the computer (Briñol, Gascó, Petty, & Horcajo, 2012). Richard Petty, one of the study researchers in this experiment, comments (2012), “The more convinced the person is that the thoughts are really gone, the better … Just imagining that you throw them away doesn’t seem to work … Of course, even if you throw the thoughts in a garbage can or put them in the recycle bin on the computer, they are not really gone — you can regenerate them … But the representations of those thoughts are gone, at least temporarily, and it seems to make it easier to not think about them” (“Bothered by”, 2012). Similarly, ephemerality gives the sense that we are liberated from what we have [wrote on the computer] (“Instant Anonymity”, 2014). Screenshots from The Quiet Place’s project “The Thoughts Room” website, created by Amitay Tweeto. A recent example of therapeutic ephemeral applications can be seen in The Thoughts Room, created by Amitay Tweeto. 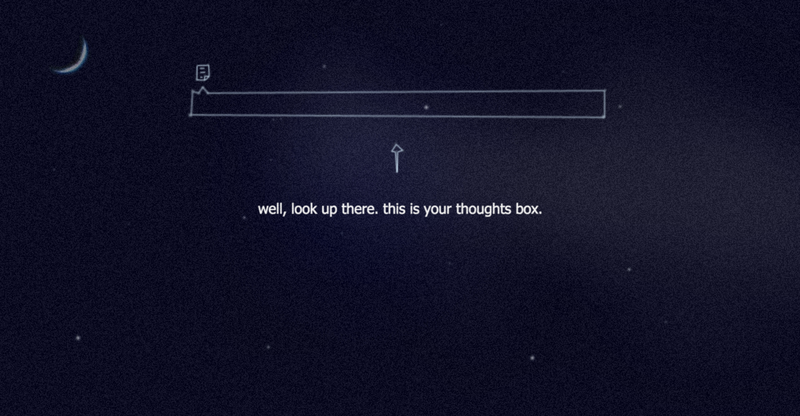 The Thoughts Room was part of a greater web project called the Quiet Place, which allows Internet users to “[escape] the Internet on the Internet, [which] makes it both counterintuitive and effective.” The Thoughts Room website “enables people to spill their emotions without being afraid anyone will judge them about it.” Upon pressing ‘Enter’ on their keyboard, “They can see the thoughts falling down and turning into stars” (Humphrey, 2012). It is evident that within the 21st century digital age, ephemeral messaging has gained popularity over perpetual messaging. The perception of memory archiving in the digital sphere has changed with the rise of ephemeral applications, such as Snapchat and Whisper. Internet users prefer ephemerality since creates an environment “of casualness, leading users to share anything from goofy selfies to sensitive information.” Many features within applications also give users a sense of control, for example, how many seconds they can view “stories”, how the information is handled, and who gets to see it (Javed, 2014). On the other hand, ephemerality can create “an Internet riddled with memory holes”, where the “decision is undermining the world’s ability to freely access accurate and verifiable records about individuals and events” (Tretikov, 2014). This can be seen through the “Right to be Forgotten” ruling, which gives “an individual [the right] to have certain data deleted [on the Internet] so that third persons can no longer trace them” (Weber, 2011, p. 125). As a result, this “… can also shape how we view our experiences, [and] how we view ourselves” (Kelley, 2016). This concern for censorship and privacy and also be viewed in the leaking of identities of Whisper, an application which promised “users to communicate without providing or disclosing their identities by posting content for public viewing” (Whisper, 2017). In an ephemeral world that is “… trying to enable is spontaneity and honesty” (Olson, 2013), issues such as lack of assured anonymity, restriction of information, and reshaping identities on the Internet only further questions ephemerality as a negative tool. Luckily, there has been indirect links to ephemerality in the space of Psychotherapy, where Free Form Writing (“Free Form Writing”, 2012) and Release Writing (Hassler, 2014) link to methods of ephemerality due to their nature of “… writing until you experience a sense of relief and emptiness” And “upon completion, [you must] burn or rip up the paper to release the energy” (Hassler, 2014), which is comparable to ephemerality’s notion of not archiving information. In recent studies by Briñol, Gascó, Petty, and Horcajo (2012), using this method on a computer has provided relief from negative thoughts. 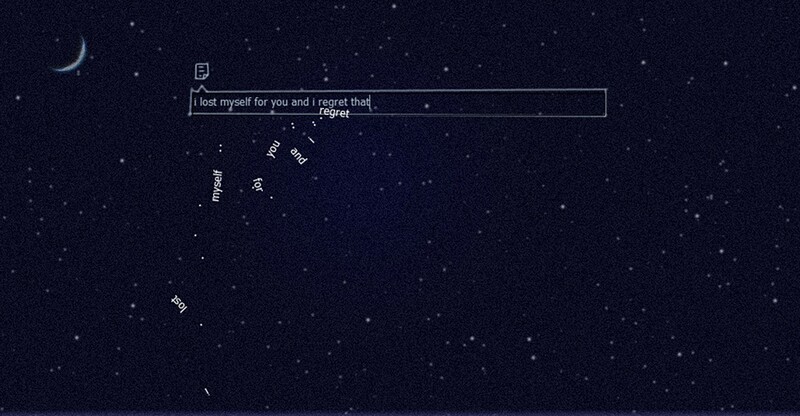 Modern ephemeral applications, such as Amitay Tweeto’s The Thoughts Room project, demonstrates therapeutic ephemeral nature by “[enabling] people to spill their emotions without being afraid anyone will judge them about it.” Upon pressing ‘Enter’ on their keyboard, “They can see the thoughts falling down and turning into stars” (Humphrey, 2012). Whether it be through a digital or physical manifestation, ephemerality has negative consequences and positive applications. Background research confirms the idea that there is a rise of platforms that give Internet users a wide range of possibilities to dealing and handling their private memories. This can be seen in the increased popularity of how users feel liberated from what we have said/done/posted using ephemeral applications (“Instant Anonymity”, 2014) and their rejection to leaving “a digital trail on social media…” (Olson, 2013). However, ephemeral social media and the web cannot be the only case for giving Internet users agency over their thoughts. It is assumed that every Internet user uniquely handles their private memories in various ways depending on their own personal circumstances. Thus, it is important to ask, how do people handle their own private memories? How do people deal with the things they want to forget, when everything feels so perpetual? It is hypothesized that web users look into other techniques, outside of the Internet to give them a sense of relief. A common quote, from an unnamed source, says: “The Internet never forgets”. If this is true, then why are Internet users so reliant on the tool of ephemerality if their memories are not truly removed from the web? What gives people a false sense of hope that their private memories are deleted? Why are Internet users’ dependent on such ephemeral applications? It is hypothesized that web users are reliant on ephemeral applications for their private memories because they lack the proper means for mental health treatment. Web users do not seek therapy or support groups to discuss their difficulties, and are thus dependent on such applications. From secondary research, it is apparent that ephemerality has a prominent space in Psychotherapy. Since there is a lack of experiments and multitude of studies that directly use ephemerality in Psychotherapy, it is important to ask, does the technique of Free Form Writing (“Free Form Writing”, 2012) and Release Writing (Hassler, 2014) yield the same relieving effect if it was digitally verses physically integrated? Is there a greater beneficiary use to ephemerality within the field of Psychotherapy? Can ephemerality therapeutically help people who wish to forget negative memories? By answering such questions, it is hypothesized that producing a digital ephemeral design artifact, designed for therapeutic Free Form Writing (“Free Form Writing”, 2012) and Release Writing (Hassler, 2014), will create a new opportunity for web users to resolve or overcome difficulties with their negative memories. Why do you think we are navigating towards this anti-archival digital world? Do you think there is any beneficiary value, or negative consequences, in either using ephemeral messaging compared to what seems to be ‘normal’ perpetual messaging? Why do you think people use these ephemeral applications [such as Whisper] as an escape and an open comfortable space to discuss their mental health? From your experience in the field of Clinical Psychology, how do people deal with the things they want to forget? How can you try to forget when everything around us seems so perpetual? How do you feel about using [the technique of Free Form Writing (“Free Form Writing”, 2012) and Release Writing (Hassler, 2014) as a] coping method? Have you ever heard of this method or advised your patients to use it? Do you think having thoughts digitally verses physically thrown out affects the way these thoughts are handled in any way? Do you think there is a difference between typing these heavy thoughts on a computer’s keyboard to a digital screen, verses a paper and pencil? Would you think users get the same “relieving” effect if they had typed it up verses wrote it down by hand? What do you think about [the idea of a digitally imposed ephemeral journal] or the idea of the ephemeral timer? Do you think [if the application posed questions in the future, after you had your thoughts deleted forever, such as like “do you remember your thoughts about this and that?”, and, “did that thought matter in the long run?”] would pose as something beneficiary, or not be a helpful feature for those who are trying to forget their negative thoughts? Do you think this design artifact could be something beneficiary for the mental health space, or for those who struggle with a variety of different circumstances or dealing with their own personal thoughts? The interview lasted 49:31 minutes, and all ten pre-prepared questions were answered by the Clinical Psychologist. When asked, “Why do you think we are navigating towards this anti-archival digital world?”, They believed there are two sides to this question. The subject responded, “that the one side is people are concerned about privacy and … their digital image that’s created, that’s out there, that others can see.” They posed an example that when “an adolescent or a teen that wants to message their friend and say or share material that they don’t think their parents would be happy about, so they’re attracted to these kinds of things like Snapchat, because it disappears … there’s no track, there’s no past record of it. And so, it feels freeing, it feels more like there’s greater privacy, and a less likelihood of experiencing shame or some kind of judgment later on in the future.” On the other hand, the subject mentions that there is “a deeper sociological change or trend that’s happening” where “our whole culture and our social systems developed before this non-forgetting-giant-archiving-machine [Internet]” was created, which is “not well suited to the reality of being human and interacting with other people.” They also believe ephemerality, “is about us as a society grappling with the idea of forgetting and the idea of archiving and documenting and who gets to control or decide what’s archived and what’s not, and should something that I say or do when I’m fourteen be there for all to see when I’m sixteen…”. When questioned, “Do you think [if the application posed questions in the future, after you had your thoughts deleted forever, such as like ‘do you remember your thoughts about this and that?’, and, ‘did that thought matter in the long run?’] would pose as something beneficiary, or not be a helpful feature for those who are trying to forget their negative thoughts?”, The Clinical Psychologist said, “It would depend a little bit on what people were writing about and what kinds of questions you ask them later to probe their memory for the event … it’s consistent with some of the principles of Cognitive Behavioural Therapy (CBT)”. In CBT, you’re often getting people to make predictions about the future, and then waiting until the future happens, and then having evidence that this confirms the prediction so then people learn, ‘Oh, I worried that this would happen, but it didn’t. Maybe I shouldn’t worry about that in the future for next time.’ So there’s precedence in CBT for the idea of tracking people’s predictions, which is similar but a little different to … what people would be writing about, but if they were just saying something that’s not disconfirm-able … for example … ‘I’m unlovable’, there’s no way in the future you could clearly disconfirm that because it’s too vague. But if you said something like, ‘My friends will never invite me to a party’, well at a future date, you can have evidence, ‘Oh look, you were invited to a party’”. When asked, “Do you think this design artifact could be something beneficiary for the mental health space, or for those who struggle with a variety of different circumstances or dealing with their own personal thoughts?”, The subject responded, “Yeah, I think it could be. I think you have the germ of some ideas there, some preliminary early ideas that seem worth pursuing to me, and just be a matter of the time to implement them and then test them”. A primary question revolving this research analyzes, how do people handle their own private memories? How do people deal with the things they want to forget, when everything feels so perpetual? The Clinical Psychologist rejected the idea of ever giving web users a method of easily forgetting when they deal with difficult circumstances. They believe that ephemeral applications “foster behaviour that’s un-seeming or problematic” due to “a false sense of security.” The subject encourages users to put the personal effort in “[making] peace with and to process past”, as opposed to depending digital applications to completely eliminate negative memories. However, the Clinical Psychologist encouraged using tools and techniques, such as Free Form Writing (“Free Form Writing”, 2012) and Release Writing (Hassler, 2014) to help cope, as it gives one the power to “become more agentic.” This confirms the hypothesis that web users look into other techniques, outside of the Internet, to assist them with their negative thoughts. Secondary questions from this research considers, why are Internet users so reliant on the tool of ephemerality if their memories are not truly removed from the web? What gives people a false sense of hope that their private memories are deleted? Why are Internet users’ dependent on such ephemeral applications? When discussing the application, Whisper, the Clinical Psychologist mentions how, as humans, we are “starved for … intimate deep kinds of connections.” Since there is a rise of ephemeral applications that openly encourages Internet users to share their confessions, it says that our society lacks deeper emotional relationships. When we cannot confide in the people around us, we are reliant on ephemeral applications, such as Whisper, to fill our need for intimate connections. Since Whisper is accessible to our world and easy to fill one’s need to confide, such applications become popular. The web has given its users the feeling that they can “control or decide what’s archived and what’s not”, which leads them to trust it in shaping their identity. This confirms the hypothesis that web users are reliant on such applications for their private memories because they lack the proper means for support groups to discuss their difficulties. However, this does not necessarily confirm that mental health treatments are not available. It means that ephemeral applications are easier and less committing than professional help. Thirdly, does the technique of Free Form Writing (“Free Form Writing”, 2012) and Release Writing (Hassler, 2014) yield the same relieving effect if it was digitally verses physically integrated? Is there a greater beneficiary use to ephemerality within the field of psychotherapy? Can ephemerality therapeutically help people who wish to forget negative memories? The Clinical Psychologist confirmed that the stated techniques follow the principles of current CBT, but that a physical artifact that one can destroy gives users greater confidence that their information is really gone compared to computers. The subject encouraged more real-life experimentation and user-testing to further confirm whether an ephemeral journaling application, set to many different ephemeral timings, various destruction options, using noises and effects successfully, and posing questions, can be therapeutic. Therefore, the hypothesis that producing a digital ephemeral design artifact, designed for therapeutic Free Form Writing (“Free Form Writing”, 2012) and Release Writing (Hassler, 2014), will create a new opportunity for web users to resolve or overcome difficulties with their negative memories is plausible and in need of more user-testing. Due to lack of studies and limitations of researchers focused in this field, it was difficult to interview someone who has more prior knowledge about ephemerality and its role in psychology. Also, due to a lack of voluntary participants who were willing to be interviewed, this study only showcases one Clinical Psychologist’s viewpoints on the subject, and can be biased. This could have been improved if there was a greater sample size to consult, whether it be through Psychologists, Researchers, or Scholars who are knowledgeable in digital applications. Results from the interview conducted proved to be useful in gaining insight on how ephemerality can be used as a tool within the field of Psychotherapy through Free Form Writing (“Free Form Writing”, 2012) and Release Writing (Hassler, 2014) and helping Internet users manage their negative thoughts.